The German daily newspaper Junge Welt on Aug. 21 published the article below by André Scheer, with Andre Wokittel in Belgrade, that describes what the refugees face from U.S. allies and client states in Europe after U.S. wars of aggression drive them from their homelands. The translation is by WW managing editor John Catalinotto. 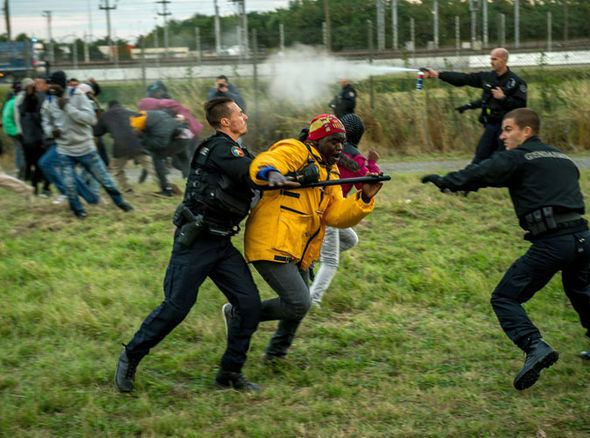 French gendarmes attack migrants on the Eurotunnel site in Coquelles near Calais. If there were an election for France’s head of state today, Marine Le Pen with her neofascists [the National Front] would have a good chance of winning the vote. Polls place her with around 30 percent, winning either first or second place, and a victory in the runoff election no longer seems impossible. In Sweden, too, the influence of the racists continues. For the first time the “Sweden Party” was the strongest force in a survey published on Aug. 20 by the daily newspaper Metro. And how do the “democratic” politicians respond to the threat from the right? Once again by adopting neofascist and racist slogans themselves. Thus, the spokesman of the Slovak Ministry of the Interior, Ivan Metik, speaking to the BBC, declared that Bratislava would accept only Christian refugees in the upcoming years; Muslim immigrants would be rejected. Similar rants come from Latvia, Estonia and Poland. Hungarian President János Áder called the people traveling through his country “besiegers” and spoke of a new “Great Migration.” General Secretary Andreas Scheuer of the Christian Social Union (Bavaria, Germany) also chose this formulation to incite against what he called “massive abuse” of asylum. In Calais on Aug. 20, French Interior Minister Bernard Cazeneuve and his British counterpart, Theresa May, signed an agreement to wall off the border between the two countries even more than it is now. They’ll form a joint command and control center to coordinate the hunt for refugees who are trying to get through the Eurotunnel to the British Isles. Already, high fences, barbed wire and heavily armed police are there to deter people. The country of Macedonia on Aug. 20 imposed a state of emergency for two regions. Four thousand refugees are trapped in the border area between the Balkan state and Greece, blocking the railway line from Thessaloniki in Greece to Skopje in Macedonia. Hungary built a 110-mile-long fence on the border with Serbia. Inhumane conditions already prevail in Serbia. For about three months, the square in front of the main railway station in Belgrade has served as a makeshift camp for people from Syria, Afghanistan and Iraq. Some of the families have received donated tents; others are camping under the stars or in a parking garage. They can hardly provide their children and babies with food. On Aug. 19, Serbia’s Prime Minister Aleksandar Vucic visited the square. Just in time, the green areas were cleaned to rid them of the stench. Before the European media, Vucic promised improvement. Hours later, it started to rain heavily. The approximately 2,000 people, including children and old people, fled to the nearby train station and to a parking garage, where they tried to dry their clothes under a canopy. On Aug. 20, the situation was hardly better. The number of toilets had been doubled; it is cleaned more often. But there is no guaranteed sanitation, medical help or meals for the people. Thus, a death strip moves through the middle of Europe. At the same time, the European Union countries keep trying to lock out the people fleeing war and misery at its external borders. Refugees are still dying during the journey across the Mediterranean Sea or on the fortifications around Ceuta and Melilla, the Spanish enclaves in North Africa. Fortress Europe kills.